I love everything about my collection of amps (currently numbering more than 60 of them), including how they sound, look and even smell. I’m even willing to put up with them when their controls get scratchy or they blow an obscure NOS tube that’s expensive or nearly impossible to replace. I even love how the glowing tubes warm up my basement in the winter during prolonged jam or recording sessions. While dozens of new products touting the latest digital modeling technology caused me to finally question whether I should keep my collection, only one product has caused me to seriously consider cashing in on my heads, combos and cabinets — the Fractal Audio Axe-FX III. 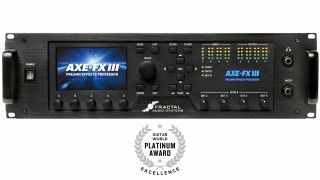 Fractal’s previous flagship units, the Axe-FX II and IIXL, are still quite impressive, but technology has grown by leaps and bounds since the first Axe-FX II’s release in 2011, and that progress truly shows in the Axe-FX III. The unit is packed with so many upgrades and improvements that I’m going to skip many of the finer details and focus on the unit’s broader appeal. FEATURES One of my biggest beefs with the Axe-FX II was that it wasn’t particularly easy to operate or program from the front panel display alone. The Axe-FX III’s full color display is a vast improvement over its predecessor’s, and the operating software is much more intuitive and easier to navigate as considerably more info is displayed on a single page instead of hidden deep in layers of pages. Of course, Axe-Edit III editor/librarian software provides the greatest ease of use and programming power, but whereas the editing software felt like a necessity before, now users won’t feel at a disadvantage when using the Axe-FX III without a computer nearby. The Axe-FX III’s selection of amp, cabinet and effect models is unequalled both for sheer variety and realism. With more than 260 amps, 2,200 cabinets and 220 effects, the Axe-FX III can provide the exact sound of almost any rig you can imagine or come very close to it. The entire signal path is audiophile quality, which means that the unit always provides pristine sound quality both in the studio and on stage. Four separate sets of stereo inputs and outputs provide more than ample flexibility for professional performance applications. For example, the outputs can be configured for a wet/dry/wet rig, a setup with separate signals sent to an onstage power amp/guitar cabinet rig, monitors and the front of house mixer, or even to perform as fully independent guitar and bass rigs. The extra inputs can be used to insert outboard gear such as preamps or effect processors into a pre-programmed location in the signal chain. The Axe-FX III also functions as a pro-quality 8x8 USB digital I/O for studio recording and re-amping applications. PERFORMANCE There is much, much more to the Axe-FX III than the features mentioned above, but to me the most impressive feature of all is how incredible it sounds. Using just a guitar, the Axe-FX III and a set of headphones, the sensation of playing is identical to the experience of laying down tracks in a pro studio control room. Each amp model not only sounds like the real deal, it also feels like the real thing too, from the transformer sag of the tweed models to the percussive attack and drum-tight low-end wallop of the modern boutique models. Unlike many amp modelers that dominate (and often obliterate) a guitar’s inherent tone and character, the Axe-FX III’s models treat individual guitars the way “real world” amps do, so a Strat sounds like a Strat and a Les Paul sounds like a Les Paul. This is particularly evident on the expertly programmed presets based on familiar songs, as the sound usually will be close but not 100 percent with the wrong guitar and dead on perfect with the right one. The selection of presets installed in the Axe-FX III covers probably 95 percent of all the sounds a guitarist could ever need, from pristine clean tones to the most intensely saturated distortions, along with a comprehensive selection of effects that outperform pro rack units that sell for more than the Axe-FX III itself. The online community for Axe-FX products is huge and robust, which means that thousands of awesome additional sounds abound even for those who prefer to plug and play rather than tweak and geek out.